If you love a good Hallmark movie, this book is absolutely for you! This is a sweet story filled with likeable characters in a town you will wish you lived in or at least could visit. While Melissa Tagg continues the story line from her debut Novel, Made to Last, this book stands alone. In Here to Stay, Blake Hunziker is returning to Whisper Shore after years of travel and adventure. He is finally ready to face his family and hometown who remember him as Blaze for a good reason. Not long after returning, he requires the assistance of Autumn Kingsley who owns and runs her family’s inn. Autumn agrees to help Blake, and quickly finds herself enjoying their time together. Autumn is desperate to finally leave Whisper Shore and begin her dream job in Paris, but in all of her planning she didn’t account for Blake. I can totally see Rachel McAdams as Autumn and Ryan Gosling as Blake! This novel is not only a fantastic romantic tale, but it is also filled with humor and interesting dialogue. Here to Stay would be an excellent beach or poolside read as it is enjoyable and easy to follow. Put Melissa Tag on your list of authors to read! 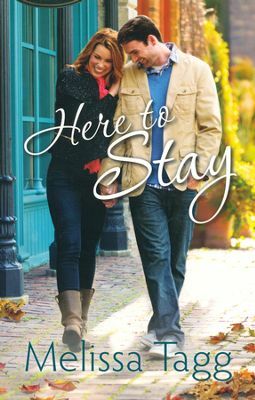 I was given a complimentary copy of Here to Stay by its publisher in exchange for an honest review. I have not been compensated and all opinions are my own. This book is fabulous. I think I was caught off guard by how much I enjoyed it. Author Patsy Clairmont has created an invaluable resource full of wisdom and advice every woman I know could utilize. I feel like have had tea with a dear friend and she has listened to all my worries and frustrations and given me truth for what ails me. 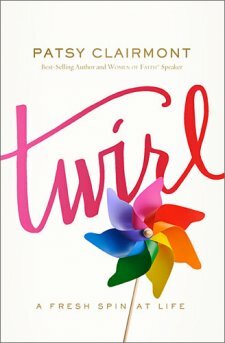 I was given a complimentary copy of Twirl by its publisher and BookLook Bloggers in exchange for an honest review. I have not been compensated and all opinions are my own. 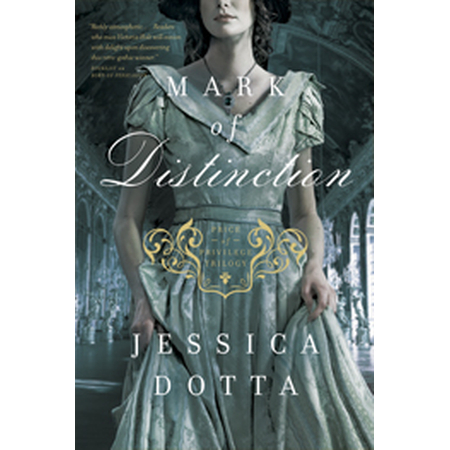 Mark of Distinction by Jessica Dotta is the second book in the Price of Privilege Trilogy. This is the first book of Jessica Dotta’s I have read. Having missed out on the first book, I quickly discovered I was missing pieces of the plot. I absolutely enjoyed Mark of Distinction, but I truly wish I had read Born of Persuasion first as I felt from the beginning that I was starting to watch a movie from the middle. Do not be deterred! This is a lovely book full of intrigue and interesting characters. I will absolutely go back and read book one and I eagerly await book three. What I love about Mark of Distinction is how different it is from anything I have read recently. In this novel, we meet Julia Elliston who has sought out the protection of her father, the very wealthy and influential Lord Pierson. In order to protect her and her new title as the Emerald Heiress, Lord Pierson keeps Julia from the outside world. He also has hand-picked her betrothed Lord Dalry. As kind and protective as Lord Dalry is, Julia’s heart belongs to another, a vicar named Edward. Because I never knew or understood the relationship between Julia and her beloved Edward, I couldn’t help but root for Lord Dalry. Jessica Dotta is definitely a gifted writer. I am excited to read the third book in the trilogy, Price of Privilege. I was given a complimentary copy of this book by Tyndale House Publishers in exchange for an honest review. 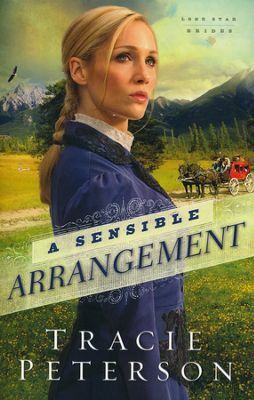 A Sensible Arrangement is Book 1 in the Lone Star Brides Series by Tracie Peterson. Had I not know this before reading the book, I would have been terribly disappointed in the ending. It absolutely left me wanting to know what happens next! Tracie Peterson is a trusted name in Christian fiction. I was first introduced to her when I read her Yukon Quest Series. I love how she continues a story through several books and characters. The characters in this book are memorable and interesting. In A Sensible Arrangement, we meet Marty Olson who has answered an advertisement for a marriage of convenience to Jake Wythe. Marty needs a way to leave her past and loss behind and Jake needs a wife to help his career. I love stories where a couple falls in love after they marry. It’s always a fun read. My favorite part of the story is when Marty saves the day in an act of heroism that I totally didn’t see coming! I laughed out loud. I definitely enjoyed this book. However, I do wish the relationship between Marty and Jake had been visited longer. Their interaction seemed limited. I would recommend this book to anyone who loves a series, and the opportunity to follow characters over time. I am anxious to read the next book in this series, A Moment in Time. I was given a complimentary copy of this book by its publisher and NetGalley in exchange for an honest review. All opinions are my own. I am thrilled to have discovered another author who tells a captivating story. Ruth Axtell has definitely won me over with this book. I am so excited to go back and read her other titles. If you enjoy Regency Romances, this book is for you! In A Heart’s Rebellion, Jessamine and her childhood best friend Megan have arrived in London for their first season. Jessamine’s heart has been broken by Megan’s brother, Rees Phillips. Jessamine and Megan are the wallflowers of the season until they meet Lancelot Marfleet who is the second son of an aristocrat. Lancelot is a vicar and not exactly the suitor Jessamine had hoped to win. Instead, she begins a flirtation with a gentleman with a less than stellar reputation. As Jessamine comes to terms with her lingering feelings for Rees, she opens herself up to possible ruination. I could so feel Jessamine’s heartache in this book! There are many times I wanted to strangle her for her stupidity! I found myself rooting for Lancelot and longing to see the hero rescue the lady! This wonderful book could totally be a BBC mini series. 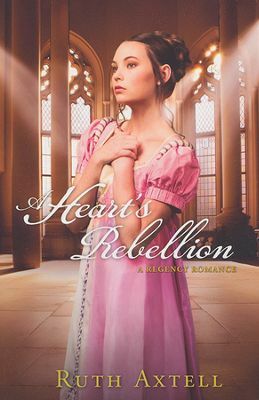 A Heart’s Rebellion is the second book in a series, but I did not feel like I was missing out by not having read the first book, Moonlight Masquerade. However, I will be reading Moonlight Masquerade because I so enjoyed this book! I was given a complimentary copy of this book by the publisher and NetGalley in exchange for an honest review. All opinions are my own and I have not been compensated. Simply put, this book is the conference of a lifetime in print form. Louie Giglio, Francis Chan, Beth Moore, John Piper, Judah Smith, and Christine Caine are some of the most beloved Christian leaders of my generation. Now, if you have ever attended a conference you know there will be sessions you hope will end quickly and others you wish would go on for hours because you are being moved in a way you imagined. While I did not enjoy every contributor’s content, I certainly found others life changing. There were two chapters in particular which had such an impact on me, I will have no problem recommending this book to anyone. John Piper’s chapter titled “Boast Only in the Cross,” left me speechless. In short, he makes clear the difference between a life well lived and a life wasted. If you purchased this book only for this chapter, it would be money well spent. 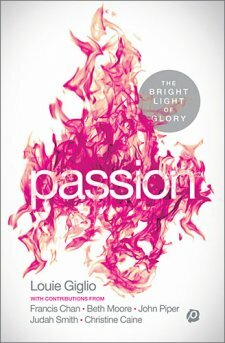 Louie Giglio’s chapter titled, “Passion, Purpose, and Designer Jeans,” should be mandatory reading for every high school graduate. Giglio speaks to bringing glory to God in whatever gifting you have. I don’t know that I would have ever pursued this book if I hadn’t been given a copy to review from BookLook Bloggers in exchange for my honest opinion. I am so glad to have had the opportunity to read it. I love when two of my favorite things collide! Fabulous food, and an amazing book! 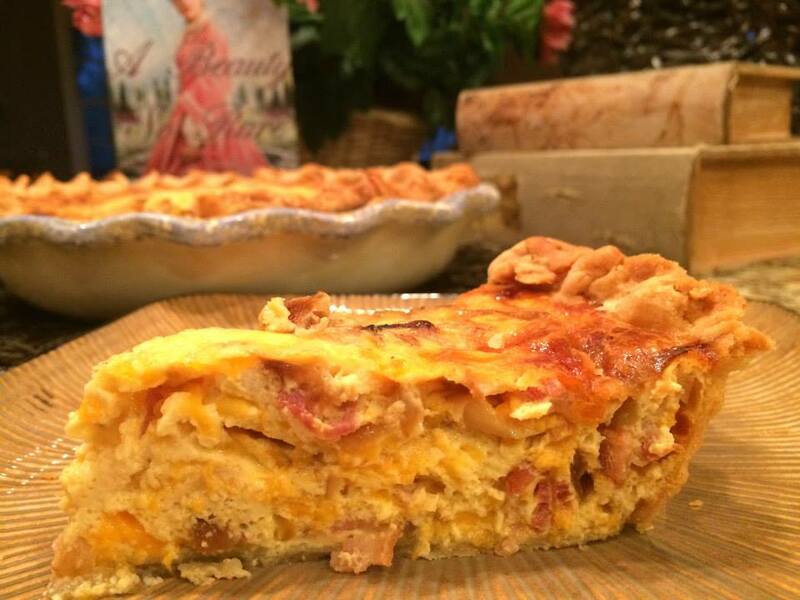 This is a recipe taken from A Beauty So Rare by Tamera Alexander. Enjoy!! Deeanne Gist has become one of my favorite authors to read. She writes these fun, romantic, suspenseful, historical fiction dramas magnificently. There is a short list of authors I read with frequency, and she is on it. 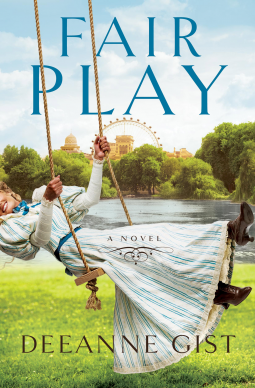 Fair Play is a title I will read again because it a great story with interesting characters. I loved it as much as I adored Love on the Line and A Bride Most Begrudging. Fair Play takes place at the Chicago World’s Fair in 1893. Billy Jack Tate is a determined female doctor who is looking to make her way in the field of medicine. She is feisty, but still very much a lady. She has just hung her shingle, but hasn’t had much of a reception because medicine is a man’s world. Billy soon meets a handsome stranger who also happens to be a Texas Ranger. He is Hunter Scott and is the definition of a man’s man. They are an unlikely pair. Hunter discovers an abandoned baby at the fair and looks to Billy for help. His discovery takes the two of them down an unexpected path. Together, they work to bring life to one of the poorest neighborhoods in Chicago. At the same time, feelings grow between them. This book is definitely a must read for lovers of historical fiction. It tugs at heart-strings with weightier matters but will also cause you to laugh out loud. I was given a complimentary copy of this book by its publisher and NetGalley in exchange for an honest review. I have offered my honest opinion without compensation. I read A Beauty So Rare this past week and absolutely loved it. It is such a great read especially if you love a well crafted love story. Here is an excerpt from the book! And, just for fun, here is the trailer for the book! Finally! A straightforward guide to how to do life as a Christian. Book stores are jam-packed with books about priorities, juggling life, and fitting God into your schedule. 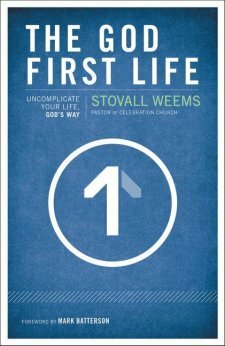 The God First Life by Stovall Weems is simple, direct, and clarifying. In his first few chapters, Pastor Stovall Weems introduces us to the idea of a God First Life. In this life, we trade anxiety and chaos for order and blessing. Throughout the rest of the book, he lays the framework from scripture of what our life should look like. My favorite chapters are on the priority of community. The reality in the Christian life is the need for relationships. We need them to get through times of growth, change, difficult situations, and healing. Stovall Weems truly addresses all of the necessities of the Christian life in this book. He gives helpful guidance in areas including worship, prayer, and devotion time. I found myself taking notes, and loving all the golden nuggets in every chapter. Another highlight in this book for me was in the chapter on serving. He says, “Serving is not something we do, serving is who we are.” Weems goes on to give a Self-test to Servants and it is definitely challenging. I highly recommend this book to new and old Christ Followers alike. It would be perfect for new believer packs at your church. The God First Life is an encouraging, life changing read. I was given a complimentary copy of this book by its publisher through BookLook Bloggers in exchange for an honest review. I have not been compensated and all opinions are my own.